PcFK1 is a member of the cysteine knot inhibitor family that displays anti-malarial properties. The naturally occurring molecule is ∼40 amino acids in length and forms a highly constrained 3D structure due to the presence of 3 disulfide and multiple intra-molecular H-bonds. Recent experimental studies on PcFK1 wild-type and mutants, where the cystiene residues of each disulfide bond were mutated into serine residues, suggest that alterations to these structural constraints can give rise to sizeable differences in SAR. 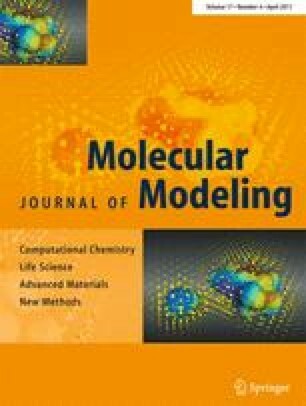 To better understand the relationship between the dynamic inhibitor 3D structure, biophysical and biological properties we have performed solution based molecular dynamics calculations over 150ns using the CHARMM forcefield. We have analyzed the theoretical trajectory in a systematic way using principal components analysis, which allows us to identify the correlated nature of the protein loop, turn and sheet movements. We have identified the key molecular motions that give rise to the differing SAR which has helped to more precisely direct our ongoing SAR studies in this important therapeutic area. The online version of this article (doi: 10.1007/s00894-010-0732-6) contains supplementary material, which is available to authorized users. We would like to acknowledge the support of NECTEC and NANOTEC who provided access to the Accelrys Software and Kasetsart University for the use of computational facilities. We would also like to acknowledge the support provided by the Chulabhorn Foundation and The Thailand Research Fund (RSA5180007).